5 Best Exercises for Calf Muscles. The training routines of newbies at the gym are disappointing. Generally, Guys dedicate 5 days per week to train the various muscles of the upper body and follow that with a measly leg workout done on Saturday, which consists of nothing but leg extension or some other machine based exercise, that too, done halfheartedly. Your legs are covered by trousers or pants most of the day, nobody gets to see them and hence you don’t feel the necessity to train them as hard as you do your show muscles. Guys are willing to dedicate one complete day to train biceps.The lower body consists of four different target muscle groups. The Quadriceps(Front part of the thigh), Hamstrings( Back of the thigh), Calves and the Hips and lower back musculature (Glutes). I mean, the ratio between the time devoted to the entire lower body and the arm muscles, is completely irrational. you would choose to train the upper part of the leg by doing Squats and Leg Extensions with a really high intensity and the calf development of most people generally takes the back seat, since very little motivation is left in the tank after that. That is the reason why many “Gym-Bros” have 18″ Arms and puny 13″ calves, which is comical. Many classic body builders ( Bodybuilders back in the 60’s, the 70’s) who are believed to have the most aesthetic bodies ever, knew the hard work and dedication required to develop a visually pleasing body. A well developed calf looks like an inverted heart, which many believe are the most visually pleasing muscle group in the human body when fully developed. And More importantly, Almost everyone of them believed that the measurements of the Neck, the Arms and the Calves should be same for a balanced physique. So to achieve this, every single one of them trained calf almost daily with a 20-25 set workout with heavy weight. Arnold bumped his calf size from a small 16″ to buff 21″ in a year using this high frequency approach. That’s right. In order to develop a big calf , you need to devote similar, if not more, time to train your calves as you would devote to your arms. A Better High Jump or vertical jump. With the benefits of calf training now listed, I hope I was able to convince you a little to get more serious about calf training. So, let’s get you ready to get those inverted hearts on your legs. Here are the essentials for training calves. The calf muscle comprises of three individual muscles:- The Lateral Head, The medial head and the soleus( lower part). Although these muscles are separate, stimulating them together is possible. Special focus on individual muscle can be provided with a little alteration in the feet position. Since the primary purpose of the calf is to walk, their rate of recovery is very high. You can train them thrice a week to achieve the development you desire. Calves require lots of heavy weights done for high repetitions for an ample amount of sets with little rest between them. An ideal calf workout should not take more than 15-hellishly-gruelling- minutes. Without further ado, Here are my picks for the Top 5 Calf exercises. This the best calf exercise there is. It works on all the three heads of the calfs and chunks of mass to the calf, when done correctly. Also, you don’t require no weight for this one. A smith machine or a similar machine is essential for this exercise. Stand with the bar resting above your traps with your chest up on a surface higher than the ground, most suitably a small box or a thick plate. Extend your ankle in an upward motion slowly, while bracing the bar. Go all the way up and then come all the way down, until your heel is below the box surface. Do this movement without developing an arch in your body and without jerking at the lower position. Little variations in the feet position attacks different muscles in the calf. Pointing the toes outward, you get more outer part while pointing toes inward hits the inner part of the muscle. This is an alternate to the above mentioned exercise, in case your gym lacks a smith machine. Although a variation, the use of free weight makes this exercise all the more special as it helps you develop your balance and apparently your grip strength too. Same to the Above exercise, but in place of a smith machine, we will hold a barbell in front the body (in the Deadlift lockout position). Just make sure that you don’t bend at the waist while descending with weight in your hand, as it takes out the isolation effect of the exercise. Calf press is an excellent exercise to develop the upper calf muscle. Also, it doesn’t have any effect on your CNS and you can kill the set until your calves die out. Using the leg press machine with a moderate to heavy weight, place the balls of your feet at the bottom of the plate of the machine, so that your heels are suspended in the air. From this position, press the weight up ahead until your ankle is fully extended and bring the weight back down to the starting position. The biggest mistake people to do in this exercise is not letting the weight down the starting point, which doesn’t allow the muscle to stretch out properly. The #1 requirement for muscle building is to Stretch and Flex the muscle on each rep. The variations done in the standing calf raise hold the same merits for this one. 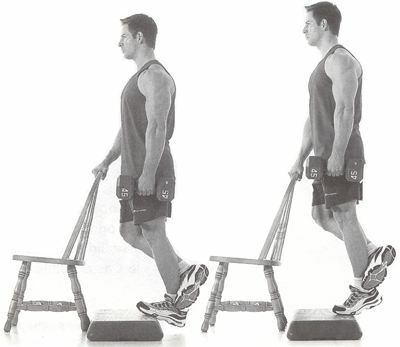 This is the primary exercise to develop the soleus and can be done with or without the machine implement. Hold the weight( A pair of Dumbbells or machine) above your knee and perform the calf raise movement until your receive an awesome pump in the lower part of your calves. You need just your body weight for this one. It develops the balance ability of the body and is an excellent exercise for the upper part of the calf. Brace yourself on a handle or something while standing on the toe of one feet. Then from here do the calf raise movement but only on one leg. A sample calf workout that can be performed every other day of the week is given below. You can change the exercises as you wish. Also, this workout will provide excellent result irrespective of your level at the gym ie., a beginner , an intermediate or an advanced person can do this. Standing Calf Raise :- 5 sets of 10-12 repetitions. 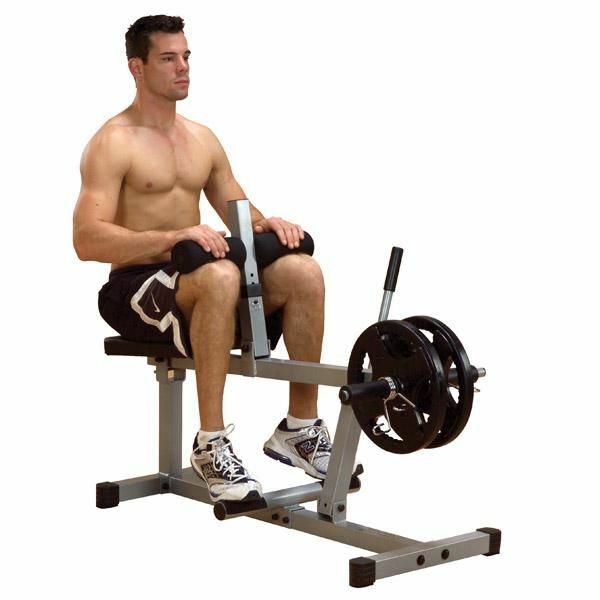 Seated Calf Raise :- 3 sets of 15 reps. The rest intervals for each exercise should lie between 45-60 seconds maximum. You can replace Standing calf raise with calf press every 3-4 weeks.